As GreenLight Philadelphia embarks on its second annual selection cycle, we are working with our Selection Advisory Council to take a proactive look at the critical needs of the city and identifying national organizations that would be a strong fit in our community. After months of discussions and surveying key local leaders in the nonprofit sector, venture capital and entrepreneurial communities, local government and academic community, GreenLight is focusing on three high-need issues on which we believe we have the greatest opportunity for impact. Below I have briefly outlined these issues and potential approaches we could pursue in addressing the problems. A growing body of research suggests targeted interventions in the first year after release – when ex-offenders are most motivated to turn their lives around – are most effective at cutting recidivism rates and achieving long-term behavior change and job stability. In our search for promising approaches to lowering recidivism, GreenLight is looking at models that target ex-offenders in these early years and have results helping them get and keep jobs and resist repeat offenses. 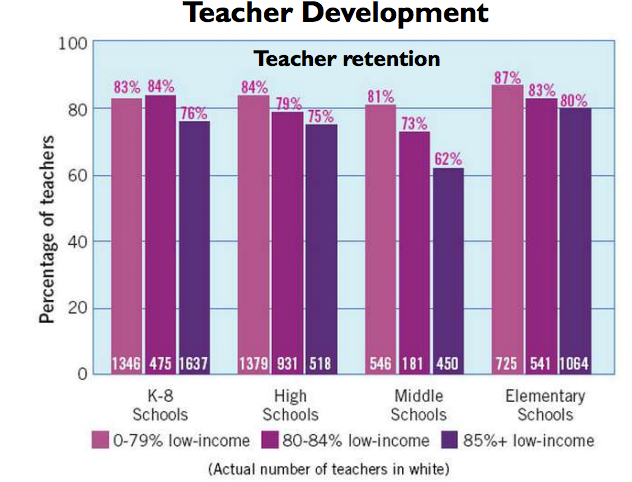 The United States faces a teacher retention problem. Over the past 15 years, teacher attrition has risen sharply across the country, impacting student achievement and exhausting resources for our nation’s classrooms. It is no surprise that teacher effectiveness improves with experience with the steepest learning curve in teachers’ first few years in the classroom. However, due to a high rate of new teacher turnover, many teachers drop out before reaching their peak effectiveness and becoming accomplished educators. Their departure is an expensive one – costing the United States an estimated $7.3 billion annually. Even more problematic, research shows that our highest-need schools are especially prone to high turnover rates. In Philadelphia, 70 percent of new teachers leave the district in six years. It is a costly problem, for both schools and families, and by allowing high teacher attrition rates to persist, the student achievement gap will continue to grow. During a period of budget shortfalls for the School District of Philadelphia and the mounting costs associated with teacher turnover, there is a great opportunity to invest in innovative models to improve new teacher induction and in the process, improve learning outcomes for Philadelphia’s students. However, in Philadelphia, access to high quality early childhood education programs remains a major hurdle for many low-income families. 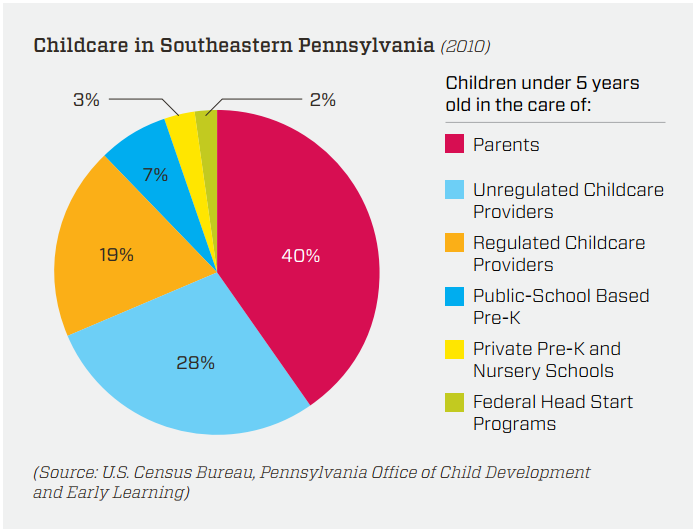 In southeastern Pennsylvania, approximately 60 percent of children under the age of five are in a childcare setting (fig. below). Of those, only 14 percent are considered high-quality. Philadelphia’s needs are two-fold: providing more access to childcare (increasing childcare slots) for young children who receive informal care, no care, or spend months on Head Start and Early Head Start waiting lists; and increasing the overall availability of high-quality childcare services, including center- and kin-based programs. Ensuring school readiness and healthy physical and cognitive development for Philadelphia’s 100,000 children under the age of five is critical to the long-term vitality of the city and its residents. It is concerning that out of 2,052 early childhood education programs, over half (58%) have no quality rating at all. Bolstering the prevalence of accreditation services and helping the slew of programs without quality ratings to become accredited is a key strategy to improving quality of childcare programs. GreenLight is exploring models that work to ensure family-based childcare programs create learning environments for children and their caretakers to excel in school and beyond. GreenLight Philadelphia has begun intensive, early-stage conversations with the city, local nonprofits and proven models across the country about addressing some of the major issues confronting our region. GreenLight sees great opportunity to make a long-term impact in Philadelphia by focusing on those issues where there is public awareness and demand to take action. Right now, three major issues we believe are most ripe with innovative approaches: expanding early childhood education, increasing teacher effectiveness, and connecting youth exiting the prison system with sustainable employment. Through an emphasis on these issue areas, we are excited to continue our pursuit of a concerted and collective effort to improve the opportunities and outcomes for all Philadelphia residents.